The past year, even more so than most, has been one of transformation for the PRI. We set ourselves an ambitious agenda for reform and renewal, comprising a new governance structure, a new three-year strategy and a revised funding model. The contribution of signatories has been critical to our success in implementing all of those changes. With the foundations in place, we have transparency and accountability, a sound strategy for 2015- 2018 and the necessary resources to implement it. The upcoming ten-year anniversary of the PRI’s founding is an opportunity to set our sights on new horizons and ask: What should responsible investment look like in another ten years? What are the key issues that we need to address? What role should the PRI play? We must look to develop a compelling vision for the future, strengthening – and where necessary, redefining – what being a signatory to the Principles means. A natural starting point is the six Principles themselves, along with the PRI’s Mission statement. The Principles were drafted before the 2007-2008 financial crisis, and primarily address the relationship between investors and investee companies. Yet much of the PRI’s work – on fiduciary duty, long-term mandates, the Sustainable Stock Exchanges initiative and more – addresses systemic issues and principal-agent problems within the investment community. This is reflected in the PRI’s Mission, drafted after the financial crisis, which talks of addressing the obstacles to a sustainable financial system that lie within market practices, structures and regulation. Should this ethos now be incorporated into the Principles themselves? Having increased accountability to signatories through governance reform, we have established the accountability of the executive by setting the metrics by which their performance in implementing the 2015-2018 strategic plan will be measured. These provide quantifiable targets on key strategic aims such as the extent to which asset owners are considering responsible investment when selecting, appointing and monitoring managers, and the impact of PRIcoordinated engagements on target companies’ awareness and acknowledgment of investors’ concerns. 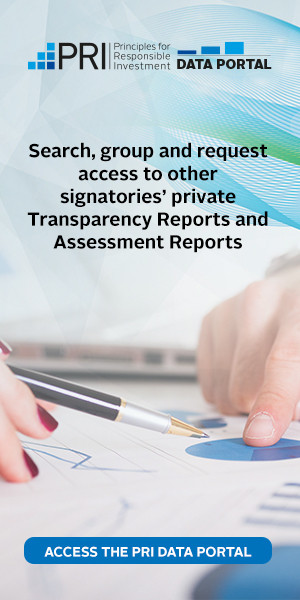 The PRI must now focus on ensuring that signatories are accountable to the PRI. We will consult with you on possible mechanisms for this, which could include new levels of membership to reflect signatories’ level of commitment to responsible investment and new criteria for delisting signatories. We must also look at how the Reporting Framework can support increased accountability. Targeting ever-greater mainstream incorporation of the concepts that we’ve spent the last decade formalising must be a key goal of the next ten years. The “Principles for Responsible Investment” may be relatively new, but having principles on how to invest responsibly is as old as investing itself. The work of the PRI and its signatories over the past decade has been less about creating these ideas than about exploring how best to incorporate them into the day-to-day realities of investment policy, strategy and practice, and about spreading the message that doing so is a vital part of achieving good long-term returns. The success of that message can be measured not only by how widely these concepts are incorporated into investment decision-making, but also by how deeply: by the extent to which they move away from being held under the umbrella of responsible investment and simply become part of investment. I extend a sincere thank you to Fiona and her team for the expansive and meaningful work outlined throughout this report. Signatories remain at the heart of what we do, and we encourage your feedback on what you read. Moving from awareness to impact is the theme that our three-year strategic plan commits us to, and everything the PRI is doing is in pursuit of this. Asset owners have always been, and must continue to be, at the heart of the PRI’s Mission to build a sustainable financial system, and their importance to the cause must be matched by the support we provide. In the past year our Asset owner climate change strategy and Long-term mandates projects have focused on the unique needs of asset owners on two crucial issues that they face. In the next twelve months we will further boost resources by dedicating a new work stream to producing asset owner insight. Along with increased support must come heightened accountability: the 2014 Report on Progress found that three-quarters of asset owners don’t formally include responsible investment performance when evaluating their managers, and around 19 out of 20 don’t consider it in deciding the performance-related pay of those in the top echelons of their organisations. We are developing the Reporting Framework to better differentiate signatories who are leading on responsible investment. This will allow us to enable and then challenge asset owners to use this data in selecting and appointing their managers, and in holding them to account. The PRI’s Reporting Framework has a unique breadth in the field of responsible investing, and the Transparency Reports constitute a remarkable public dataset. We must also look at systemic challenges. Last year I talked about our policy work having “begun”. There’s no doubt that this year has seen it truly arrive. Fiduciary duty in the 21st century is both a fundamentally important investigation of why investors are not systematically integrating environmental, social and governance considerations as part of their fiduciary duty, and a practical guide on how to fix this. For our impact on investors to be meaningful, it needs to be reflected in their impact on companies. Collaboration, at events and through our Clearinghouse platform, has happened at a greater scale than ever before this year. It is imperative that we maximise the output of this work by increasing the number of signatories engaging for influence, not just for information, and by evaluating the effects of PRI-coordinated collaborative engagements on targeted companies’ policies, practices and disclosure. Building towards COP21 in Paris in December, the PRI has focused on climate change through a number of initiatives run in conjunction with our UN partners and a range of global and regional climate bodies. The Montréal Carbon Pledge, launched at PRI in Person 2014, has succeeded in attracting more than 50 investors to commit to measure and publicly disclose their portfolio carbon footprint. In giving investors a quantitative understanding of the carbon emissions represented by a portfolio’s holdings, a carbon footprint is an invaluable tool for creating and implementing a broader climate change strategy. Looking outside our walls, only with a strong voice can the PRI be truly effective. Our extensive coverage in outlets such as the Financial Times, Reuters, Bloomberg, CNBC, BBC and Institutional Investor is evidence of the progress we’ve made in building our ability to be heard. Thank you to Martin Skancke for his dedication in Chairing the PRI Board and guiding the direction that the PRI will continue to take, and thank you to the entire Board for the insight that they bring from across the globe. The PRI’s skilled, diverse and hard-working staff also deserve credit for enabling the incredible array of services that support our signatories. The assets under management of our signatories grew by a third in the past 12 months to reach US$59 trillion. Growth in our signatory base is welcome – it means that there is ever-widening belief in the Principles and it increases our signatories’ collective influence – but within the PRI it must be seen not as success but as a responsibility, to better support those signatories to achieve the impact we all seek.